The name Drunken Tiger has not headlined a US concert in nearly 7 years. So on the eve of his much anticipated Los Angeles concert, the Los Angeles Times has also taken notice of the artist whose name will be highlighted on The Wiltern’s distinguished marque tonight. Only a few Korean artists have had the opportunity to have their own feature article in prestigious publications, with the singer, Rain, taking the crown after his frontpage feature in the New York Times in 2006. However, JK’s extensive interview in the LA Times comes close for the win. 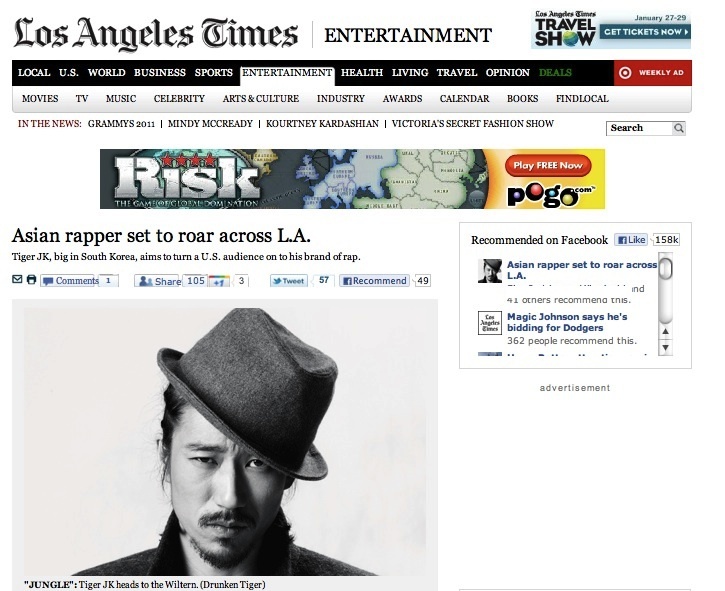 The article highlights how Drunken Tiger, despite facing censorship in their initial debut in Korea, became one of the first artists to be successful with overseas fans. While the international market’s interest in K-Pop has evolved so quickly and made it easier for fans to learn about him, JK also expresses his mixed feelings about its success. To read the whole article, visit The Los Angeles Times’ Entertainment section.